« HOTTEST Artificial Intelligence Hub: Israel’s High Tech Industry – Why? Objectives The objectives of this study were to evaluate outcomes of pulmonary valve replacement (PVR) in patients with chronic pulmonary regurgitation (PR) and to better define the optimal timing of PVR. Background Although PVR is effective in reducing right ventricular (RV) volume overload in patients with chronic PR, the optimal timing of PVR is not well defined. Methods A total of 170 patients who underwent PVR between January 1998 and March 2011 for chronic PR were retrospectively analyzed. To define the optimal timing of PVR, pre-operative and post-operative cardiac magnetic resonance imaging (MRI) data (n = 67) were analyzed. Results The median age at the time of PVR was 16.7 years. Follow-up completeness was 95%, and the median follow-up duration was 5.9 years. Overall and event-free survival at 10 years was 98% and 70%, respectively. Post-operative MRI showed significant reduction in RV volumes and significant improvement in biventricular function. Receiver-operating characteristic curve analysis revealed a cutoff value of 168 ml/m2 for non-normalization of RV end-diastolic volume index (EDVI) and 80 ml/m2 for RV end-systolic volume index (ESVI). Cutoff values for optimal outcome (normalized RV volumes and function) were 163 ml/m2 for RV EDVI and 80 ml/m2 for RV ESVI. Higher pre-operative RV ESVI was identified as a sole independent risk factor for suboptimal outcome. Conclusions Midterm outcomes of PVR in patients with chronic PR were acceptable. PVR should be considered before RV EDVI exceeds 163 ml/m2 or RV ESVI exceeds 80 ml/m2, with more attention to RV ESVI. Relief of right ventricular (RV) outflow tract obstruction in tetralogy of Fallot or similar physiology often results in pulmonary regurgitation (PR). The resultant chronic volume overload can lead to RV dilation, biventricular dysfunction, heart failure symptoms, arrhythmias, and sudden death (1–5). Pulmonary valve replacement (PVR) can lead to improvement in functional class and a substantial decrease or normalization of RV volumes (6,7). Other potential benefits of PVR are improvement in exercise capacity (8) and decrease in QRS duration (9). However, benefits of PVR have to be weighed against the risks of this procedure. Although operative mortality of PVR is low (6), post-operative morbidities are not negligible (10) and patients are exposed to the risk of repeat PVR (11–13). PVR is indicated when patients become symptomatic or at risk for life-threatening arrhythmias (14). For asymptomatic patients, there have been debates regarding the optimal timing of PVR (15–19). Magnetic resonance imaging (MRI) is a gold standard for evaluating RV volumes and function (20), and these MRI parameters can be used to decide the indications for PVR. Many studies dealing with changes in MRI parameters after PVR have been reported (7–9,21–26). However, most of them have a limitation of small patient numbers, and there are few studies suggesting the optimal timing of PVR (7–9). The objectives of this study were to evaluate outcomes of PVR performed in patients with chronic PR and to better define the optimal timing of PVR by analyzing MRI parameters. Pulmonary valve disease treatment depends on the severity of your condition, whether or not you’re experiencing signs and symptoms, and if your condition is getting worse. Pulmonary atresia is a congenital heart defect in which a child is born without a well-defined pulmonary valve. In pulmonary atresia, blood can’t flow from the right ventricle into the pulmonary artery. The only blood flow to the lungs is through an open passageway between the pulmonary artery and the main artery supplying blood to the body (aorta). For some people with mild pulmonary valve disease without symptoms, careful monitoring under a doctor’s supervision may be all that’s needed. A number of patients with congenital heart disease have problems with their pulmonary valve, either since birth, or after cardiac surgery. For many patients, a valve replacement may be recommended. Until the last decade replacing a faulty pulmonary valve could only be done with open heart surgery. Because all surgically implanted valves have a limited life-span, patients faced many surgeries over the course of their life to replace the pulmonary valve. The percutaneous, non-surgical option to replace the pulmonary valve has revolutionized the care of these patients. Who can benefit from TPVR? Tetralogy of Fallot who have had prior surgery but now have a leaky or narrowed pulmonary valve, especially if they have undergone a prior surgical replacement. 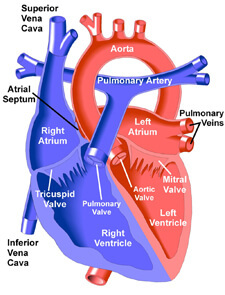 Patients with other underlying diagnoses who also have a surgically implanted pulmonary valve (such as a homograft or a bioprosthetic valve) that is no longer working well; including patients with truncus arteriosus, patients with aortic valve disease who have had a Ross procedure, and some patients with pulmonary stenosis or atresia. The goals of transcatheter pulmonary valve replacement is to replace the pulmonary valve non-surgically and decrease the number of heart surgeries a patient will need over their life-time. Diagnostic tests including an echocardiogram, cardiac MRI, or cardiac CT scan (the latter if you cannot have an MRI due to, for example, having a pacemaker). There are 2 valves currently approved by the FDA for this indication, the Melody valve and the Edwards SAPIEN XT valve. Both are tissue valves that are sutured to a stent, which is a thin metal cylinder that is mounted on a balloon catheter. The procedure is performed in a pediatric and adult congenital cardiac catheterization lab by an interventional cardiologist with expertise in congenital cardiac interventions, utilizing fluoroscopy and angiography to see the anatomy and evaluate the function of the heart valves. A catheter is placed through a small incision into the femoral vein (in the groin) or the jugular vein in the neck. A compressed tissue heart valve is placed on a balloon catheter; advanced through the vein to the heart, and is positioned directly inside the diseased pulmonary valve. Once in position, the balloon is inflated expanding the stent and the valve is secured in place. The new valve immediately begins to work. The catheter is then removed. Patients are observed overnight and discharged the following morning. Usually you can return to your normal activities in 7 days. Physicians with expertise in catheter interventions for congenital heart disease have been performing this procedure at the Cleveland Clinic since 2010. Both the Melody valve and the Edwards SAPIEN valve have been used, depending on the size needed for a particular patient. No patient with underlying congenital heart disease has had a severe complication and no patient has required removal of the valve to date. Why doesn’t my heart valve work properly? From The Illustrated Field Guide to Congenital Heart Disease and Repair – Second Edition courtesy of Scientific Software Solutions Inc.
Stenosis – the opening of the valve becomes smaller, thus allowing less blood to flow through. Regurgitation/Insufficiency (leaky valve) – the valve does not close properly and allows blood to flow backward as well as forward in the heart.